Hannah Thompson’s short story plays with the light and dark of fairytales. Illustration by Ashley Floréal. The sky was stormy that night as Shula walked towards the cliff path for the first time. The brambles surrounding the muddy track grew taller than her head and tore at her hands. The thistles caught on her dress and she trod in every puddle with her slippered feet. She was two when her parents died and she was sent to live with her withered aunt and brittle uncle. They had not been blessed with children and it grew inside them like weeds. Shula was too talkative, too curious and far too beautiful. But she belonged to them. She arrived in the moonlight, wrapped in blankets, with a warning; ‘Shula should not be in the sun. It does strange things to her.’ So she spent her days and years behind heavy curtains, cooking and cleaning as soon as she was tall enough to reach the stove. Her nights were spent sneaking out to play with imaginary pixies in the starlit garden. As she grew, so did her discontentment. She had no real friends and no company aside from her ageing aunt and uncle who grew more demanding by the day. She spent hours plotting how she could leave, but she had nothing and no idea what lay beyond the locked gates and high fences. When she peered from the upstairs windows, all she could see were fields and beyond that, cliffs, the grey sea and the old lighthouse. But one dark autumn night, on the eve of her eighteenth birthday, the wind began to change. As she swept the front path and dreamt of escape, a piece of bright white paper caught her eye against the dark wood stain of the heavy gate. She twisted it from its hiding place below a hinge and balked when she saw her name written in block capitals. Her aunt had taught her to read so she could ‘make herself useful’ and write the household letters. She glanced behind her at the house. It was still. She tucked the note into her apron pocket and hurried back up the path to the shelter of the porch. She placed the broom carefully against the wall and pulled the note out. The paper was thick, slightly rough to the touch. The ink was jewel black and the writing wild. She gently unfolded the note. I’ve admired you from afar. That was all it said. No name or clue who had sent it. Shula turned it over in her hands as her mind raced. Who could have written it? She knew no one but her aunt and uncle, and had never been allowed to leave their house or garden. Was it even meant for her? She climbed into her cold bed that night and didn’t sleep a wink, the note clutched in her hand and her dark eyes wide. After that, the notes came once a week, telling her how lovely her long dark hair was, how they had never seen anyone like her. One day, the letter-writer asked her to write back. Shula didn’t sleep for days as she lay awake, clutching the notes and wondering what to do. It was a bitter night in January when she decided to sneak downstairs and steal the blue pen from her aunt’s bureau. She scrawled Who are you? at the bottom of the paper, then crept down the frozen path to the gate and wedged the note back in the gate. The next evening it was gone. The reply didn’t come for weeks. Shula thought the notes would never appear again when one rainy night in February she saw the familiar paper waiting for her. The black ink had run but she could still make out the words; I’m Jed, the fisherman’s boy, I live in the hut near the sea. She read the note several times before folding it up again and tiptoeing back through the heavy house to her hard bed. She couldn’t fathom how the fisherman’s boy even knew she existed, let alone if she was beautiful or not. But her butter y heart ew with the kind words she read and she knew straight away that she was going to reply. The very next night she did, with the words; I’m Shula. I’m trapped here with my aunt and uncle. I can’t leave because the sunlight hurts me. Months passed. Jed and Shula wrote every single day. But every day wasn’t enough, and two or three lines was all the paper would allow. Shula began to ache with the need for a different life as she burnt food, broke ornaments and earned herself several bruises along the way. Her uncle’s hands left marks on her legs as she sloshed hot tea into his lap, her mind alive with the thought of Jed and his fishing boat, the waves carrying them far, far away. Further than her mind could even fathom. And so, on that stormy night in April, Shula found herself climbing the old apple tree in the back garden, crawling along the thin branches and, with some effort, dropping herself over the fence into the weeds below. Her feet found the well-worn path that Jed had described, as she fought her way through the undergrowth towards the cliff path, and him. He had given her clear directions. Follow the cliff path until it turned to the left, then leave the path and walk towards the cliff edge straight ahead, through the long grass. There were secret steps there that led to an enclave in the rock, two thirds of the way down, where his hut lay beyond the reach of the sea. He would be waiting with a light at the cliff edge. There was no moon that night and the stars hid behind fat clouds. Shula walked as fast as she could but the night was haunted with shadows and unknown sounds that all wanted her to turn back. As she felt the worn path start to change direction beneath her feet, she paused and peered ahead. There was a steady ash from the lighthouse but nearer than that, straight ahead, was a dull yellow glow that hung still. Her heart jumped as she pushed forward through the thick grass, looking up every few seconds to make sure the light was still straight ahead. As she walked, the grass grew even longer and a mist descended so it was even harder to see. But the light gradually got bigger and bigger, and the waves grew louder and louder, until the light was only a few metres away. She still couldn’t make out Jed’s shape in the darkness as she stepped forward, a smile breaking on her tense face, but before she knew it, her feet were twisting on crumbled rock and she couldn’t steady herself as she tumbled forward into dead space, the cliff falling away beneath her. The thick air could do nothing to catch her as she fell past the long pole that the yellow lantern hung from, and towards the crescendo of waves below. The swirling sea swallowed her whole, dragging her body back with fierce currents before flinging her like a sacrifice onto the jagged rocks. She lost all sense of time as she spun back and forth, ailing like a sh on a hook. She had never been in the sea before, let alone swam, and there was no way to fight against the great mass of water. As she was flung against the rocks for the third time, her fingers managed to cling weakly to them as the water fell back. She lay there, unable to move. Bloody, bruised and shaking, she waited for the heavy wall of cold to break against her back. But it didn’t come. She managed to pull herself off the rock and fall onto the wet shingles where the sea had been. She lay there for a few seconds, unable to move again but still, the sea did not come. She started to crawl up the beach but she could only move a few centimetres. And still the sea did not come. Suddenly, there were warm hands on her arms lifting her up. She could do nothing as her body was heaved onto an unfamiliar shoulder and carried along the beach, then up the steep cliff steps. As she passed out, the waves crashed against the cliff edge again in fury. Pain was only the second thing Shula felt when she eventually stirred, hours later. The first thing was warmth. Her eyes slowly opened to white curved walls as her ears made sense of the faint call of gulls against the gentle roll of waves. She soon realised that she was in the lighthouse. She struggled to sit up against the thick pillows she was lying on, still in her damp dress, underneath a sheet and scratchy blanket. It was a narrow bed, pushed awkwardly against the curved wall, in a room crammed with a small table and chairs, a kitchen, and a large armchair that faced away from her. A pair of skinny legs in dark trousers dangled over the side, wearing holey red socks. A thick curtain moved in the breeze of an open window, letting tiny cracks of light in through the sides. ‘Shula,’ she whispered. Albert nodded and they both looked away, shyly. He turned awkwardly towards the window and before Shula could speak again, he pulled the curtain back and the midday light filled the room. ‘No!’ she shouted as the heat fell onto her bruised skin. She had avoided the sun for as long as she could remember, and the pain was unbearable. ‘What’s wrong?’ Albert cried, as he ran to her. ‘The sun,’ she winced. Her skin was starting to smoke as he flung himself back across the room and yanked the curtain closed. Shula crawled to her feet as he turned back around and stopped in shock. Shula looked down at her hands, arms and legs and saw the flames covering her where the sun had touched. 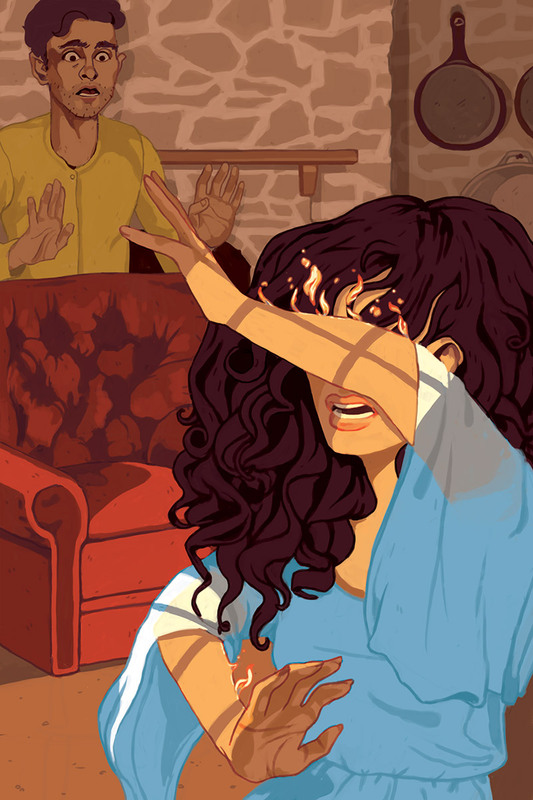 But although her skin felt like it was burning, the flames were not damaging it. They were coming from it; a sparkling purple mixed with yellows, oranges and blues. Her right hand moved to her left arm and ran down it, seeming to collect the flames in a ball, leaving her skin clear but tingling. She did the same with her face, legs and other arm and stood there, eyes wide with the large ball of flames in her hands. Before she realised what was happening, a large stream of water was hitting her hands and the flames were sizzling. To Shula’s surprise, the water was owing from a bucket on the floor to her as Albert stood with his hands outreached, controlling the water from across the room. She knew then that Albert had stopped the waves and saved her from the sea. Shula came to realise that there was no Jed. When she returned to her aunt and uncle’s home, she found them gone. As she searched through their things, she came across a stack of rough white note paper and a jewel black ink pen. A few days later, Albert found their bodies washed up on the shingle beach, not far from where the yellow lantern still hung on its pole, the flame long dead. Shula and Albert carried her aunt and uncle back to their old wooden house in a wheelbarrow as the sun came up, laying them in the porch. As her skin tingled with the sun, Shula let the flames leave her fingertips and catch onto the dead climbing rose that covered the front of the house. The flames slowly spread and as she watched them envelop the building, she knew she was no longer afraid of the light.